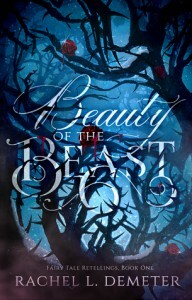 Not only is the cover of Beauty of the Beast gorgeous, but the story is a beautifully written reimagining of Beauty and the Beast. This is the first novel I've read by Rachel L. Demeter and certainly won't be the last. The story is so vibrant I felt like I was there, even during the few horrifying moments both Isabelle (Beauty) and Prince Adam (Beast) experienced. As the synopsis warns, there is strong sexual content and sexual assault in the novel (not committed by the hero), so I wouldn't recommend this for readers under 18. Without giving anything away, I also want to warn you that there's a very upsetting tragedy (well, several really) in the beginning which was difficult for me to get through because it tore my heart out and chopped it up in a blender. Let's just say I totally get why Adam chose to isolate himself and is difficult to thaw out when interacting with Isabelle. But soon an undeniable attraction grows between them, simmering at first, then boiling. I wanted to shout at them to get together already and couldn't figure out if they would or wouldn't. Honestly, I enjoyed being kept in suspense. There are sweet moments, angry ones as well as immensely sad ones. I was taken through the gamut of emotions, the entire spectrum while reading Beauty of the Beast. It was an emotional roller coaster ride, but one in which I wouldn't mind going through again. I'm now anxiously anticipating which fairy tale Demeter will reimagine next. Fingers crossed for The Little Mermaid! !